I ordered Chanel Black Pearl soon after it went up on their website but put off trying it in case it turned out to be a disappointment like Steel and Strong were for me. 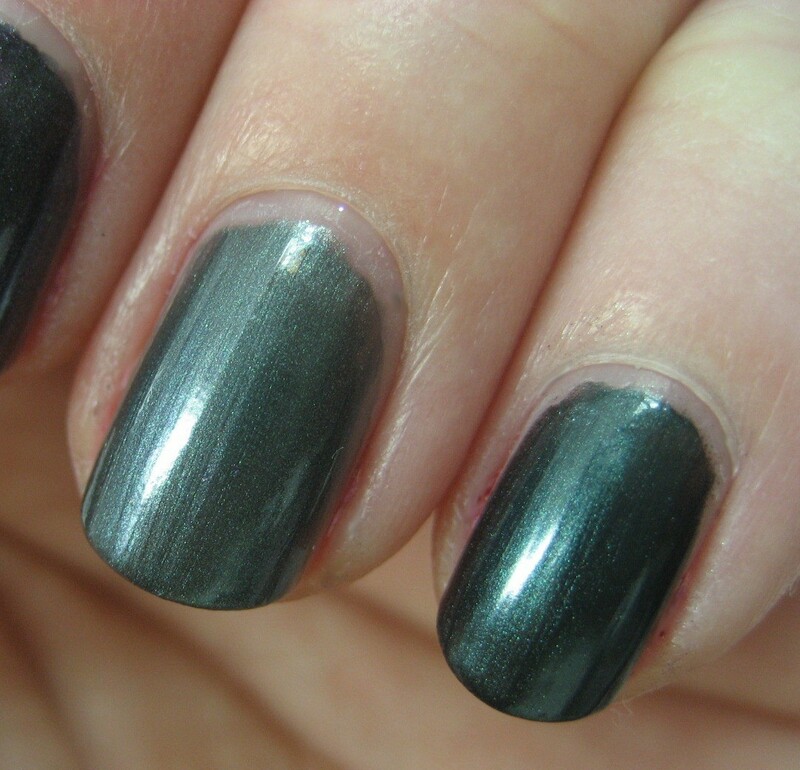 Black Pearl is a charcoal shimmer with a definite green tone to it. I do like this much better than Steel or Strong. It's an interesting color and doesn't look black in low light. It applied nicely, needing only two coats (these swatches are, as usual, over base coat but without top coat). I'm not loving the brushstrokes, though; for $25 I think they should settle out better than they did. I will just have to save this one for when I have steady hands, I suppose. I couldn't think of a dupe for this in my stash but that did not stop me from doing a comparison. 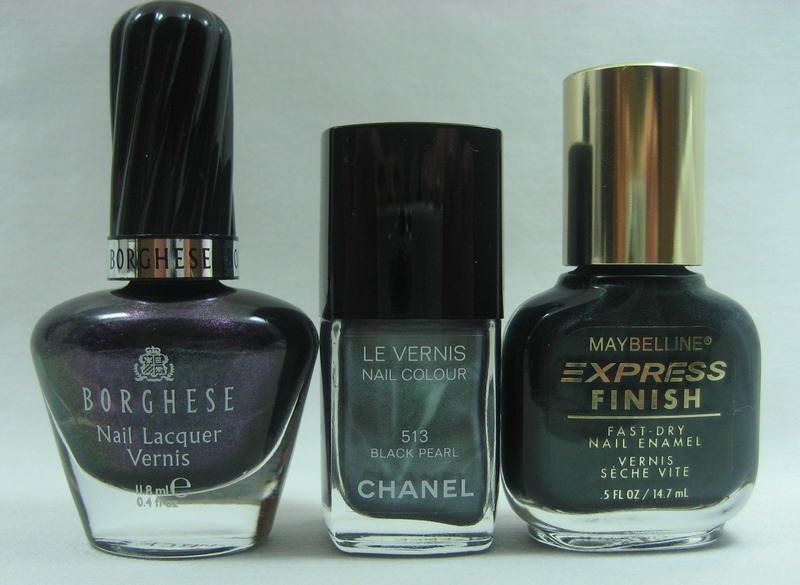 Before Black Pearl was released, a couple people speculated that it might be similar to Borghese Stellare Notte, which has some green in it (visible from certain angles), so I pulled that, plus Maybelline Blackened Teal, an oldie but goodie I got from the Dollar Tree some time back. Top to bottom: Black Pearl, Stellare Notte, Black Pearl, Blackened Teal. Stellare Notte's is too dark and has too much purple in it to pass for Black Pearl. Blackened Teal, though, is a lot closer than I expected. 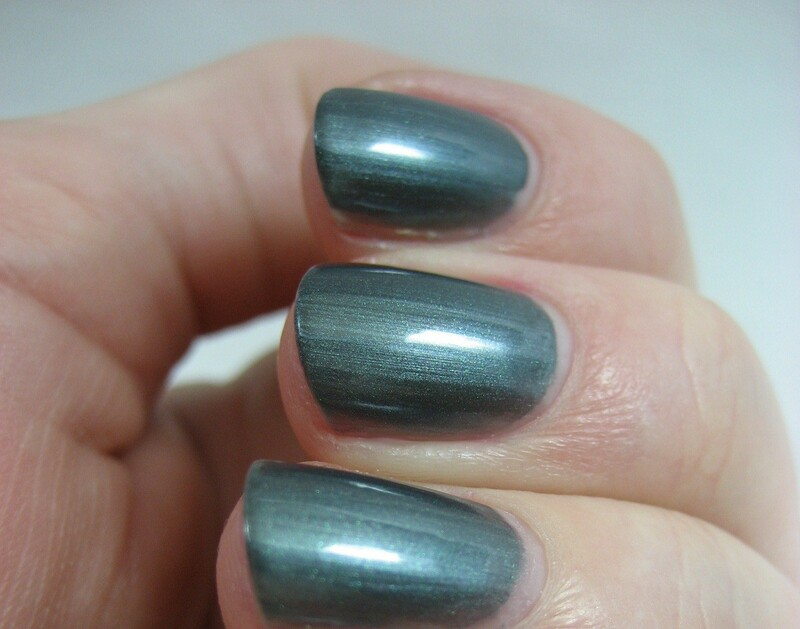 It's darker than Black Pearl but the base color and finish appear to be very similar. I bet it would make a good base for a Black Pearl franken; too bad it's not widely available anymore (thought there are a few up for swap on MUA and for sale on eBay). 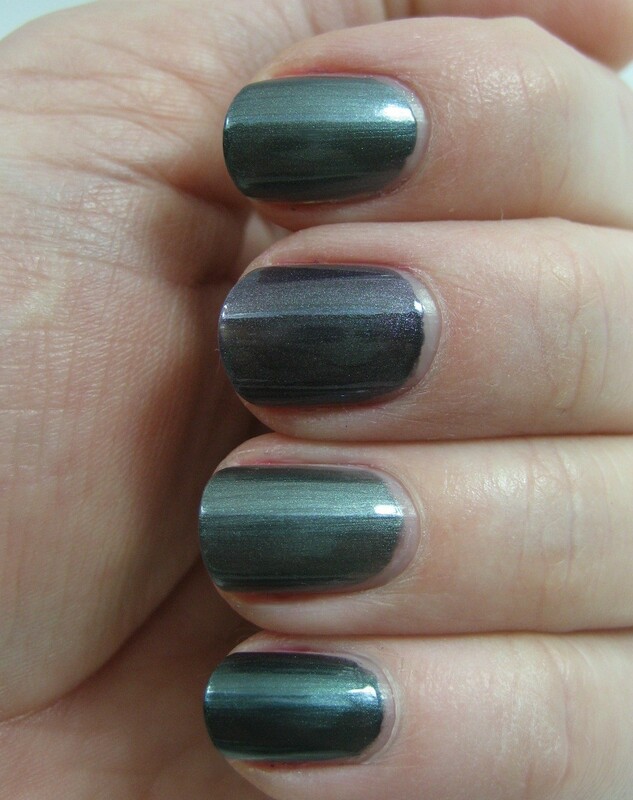 Black Pearl (left), Blackened Teal (right). I think I'll be keeping Black Pearl. I know some people have mentioned this in other places, but I have Wet n Wild Morbid and I think it looks fairly similar. Black Pearl is really unique; thanks for swatching! So glad it's not a dupe, at least you got your money's worth there! Not so crazy about this polish... is it just me or does it look outdated?? Oh Chanel, it disapoints me. The only one I loved was pretty much Paradoxal, I understood the hype for THAT, and I'm pretty sure it's much the money. But thissss. 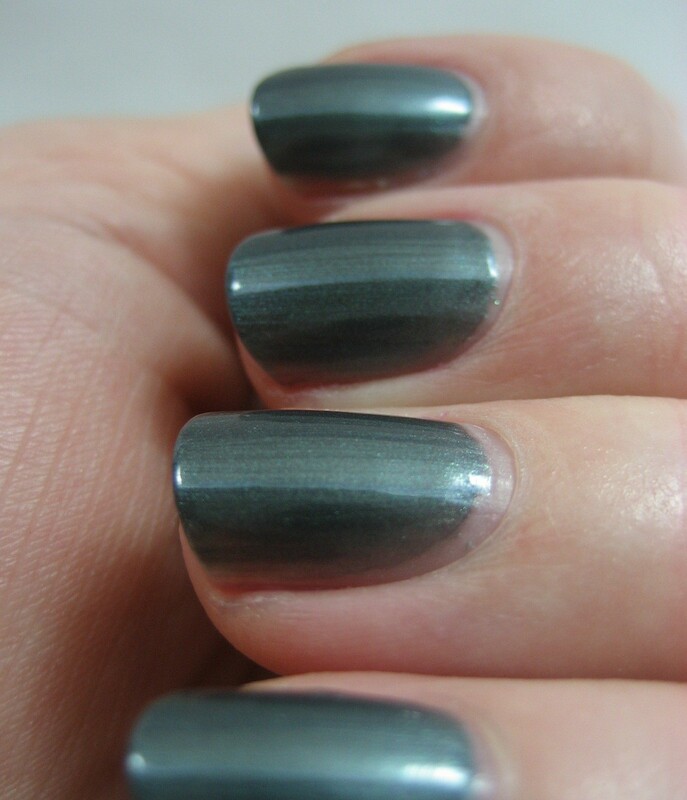 Although you can't find a dupe, I don't this is a must-have, not very fond of the color well. Your swatches are lovely, I couldn't have done a better job myself. This looks fantastic on you! I personally like it, but don't love it so I just can't stomach the $25!! 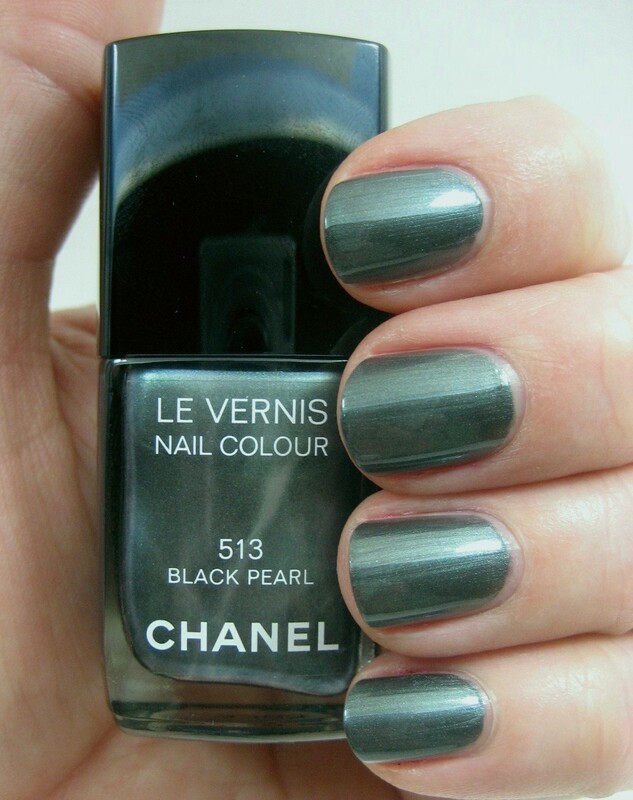 I doubt I will ever own a Chanel polish -_-. it looks really good on you. i understand about the expensive brush strokes.